A common complaint made by denture wearers is that after prolonged use of dentures, they eventually lose the original luster or shade of white that was preferred at the time of the original fitting. 1. Is there a way to eliminate the yellowish look? 2. Can a toothpaste whitener be used? 3. Can I add some clorox bleach when I clean them? 4. Can I put those whitener strips on them? There is no way to "whiten" denture teeth beyond what they were new. If they're stained, take them to a dentist who makes dentures and he can easily polish back to their original shade. Then use something like Polident every night. To maintain the greatest degree of whiteness (lack of stain) a variety of solutions and ultra sonic cleaners may help. Listed below are some popular brands. All products can be researched easily through the use of internet search resources. Most products are available through a variety of distributors and retailers. Reportedly destroys pathogens usually found on prosthetics such as Candida albicans, Actimoyces viscosus, Streptococus mutans and Streptococus pyogenes. Removes Tough Coffee, Tea, Iron And Nicotine Stains. Product can be used as a stand-alone product or in combination with different brands and types of ultrasonice and nonultrasonic cleaners. Removes stains and odor causing film Leaves dentures feeling fresh and smooth Dentures fit and taste better. Provides flexibility for denture wearers to use different denture cleaning compounds and solutions to produce varying degrees of ultrasonic cleaning. Probably one of the most well known and well respected oral hygiene products manufacturer, Oral B offers specialized brushes for maintaining denture and partial products. Included in the package: A large, multi-tufted brushhead helps remove food particles and stains easily. A smaller, angle-trimmed brushhead for hard-to-reach surfaces. Many consumers combine the use of denture brushes with ultrasonic cleaning to boost overall efficiency. Reportedly the first device with combinations of technologies, the Violight product can be used for cleaning everyday items like dentures, retainers, bite-plates, sport mouthguards, invisible braces, and whitening trays. The Violight Dental Spa is battery operated, for portability and requires only plain tape water. A built automatic shutoff device operates at 5 minutes. NanoSilver, a proven antimicrobial substance, is active against most pathogens, yeasts, fungi, mold and mildew. The material is embedded into the device for maximum protection. A cleaning device that reportedly breaks down stubborn calculus on dental appliances, in about 15 minutes. 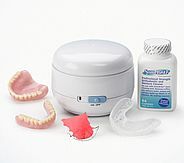 Best suited for dentures, retainers, partials and mouthguards. A denture, tooth paste like product manufactured and distributed by world renowned Glaxosmith pharmaceutical companies. A denture cleaning compound designed to be used outside of the mouth. An ultrasonic cleaner that can be used for a wide variety of dental appliances, including retainers, Invisalign Clear Aligners - Braces, dentures, partials, mouth guards and night guards (anti teeth clenching devices). A stainless steel tub is featured in the construction, providing a servicability advantage possibly, over other products that are 100% plastic construction.